Building a stone walkway is a wonderful way to enhance the "country" feel of a yard, being quite in keeping with a cottage garden design. A brick path, by contrast, will complement a formal landscape design. The project described below is well-suited for do-it-yourselfers, although some heavy lifting may be required. Many people use "flagstone" (picture) for projects of this nature; the material that you, yourself end up obtaining for the job may or may not go by this name. The main thing to remember when making your selection is that the ideal material for this project will consist of the largest, flattest solid rocks you can find and maneuver. A 2-inch thickness should be considered the minimum; in my instructions below, I go with a 3-inch thickness. Keep in mind that greater mass equals greater stability. For the sake of consistent measurements, for our rock material I am assuming pieces roughly 3 inches thick. If the material with which you are working is thinner or thicker, adjust the excavating measurements (Step 8) accordingly. First, choose the path that your new landscape feature will take. Avoid having stone walkways run under large trees. Not only may the tree roots eventually damage your stone walkway, but the latter may also damage the tree roots. As with landscaping around a septic system, when you landscape around a hardscape path, you have to take into account that some species of trees and shrubs will be incompatible with it. Some trees tend to put out roots close to the surface; these roots could pose a problem in this project. Maple trees are an example. 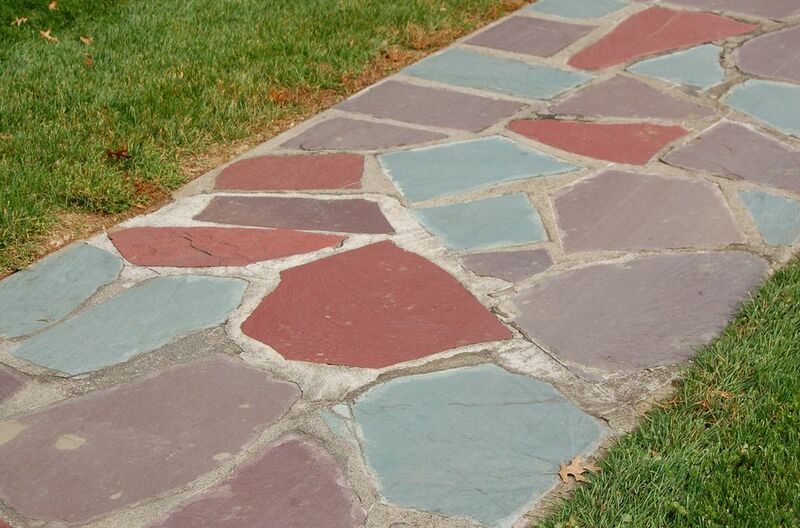 Once you have chosen the route for your stone walkway, you will need to mark it. But first, determine whether you wish your path to be straight or curved. Not sure which is right for you? See below. For straight stone walkways, begin by standing at one end of the projected path, holding a ball of string in your hand. Have a partner begin to unravel that ball of string, walking to the other end of the projected path. Decide whether this will be the left or right-hand side of the path. Each of you will then drive a stake in the ground where you are standing, tying your end of the string to the stake. How wide do you want the stone walkway to be? A rule of thumb is to make a pathway wide enough so that two people could stride it side by side. But it is really up to you. Let's use a 3-foot width as an example. Each of you would then measure 3 feet over from your first stake, mark the spot, and repeat the process of running string from end to end. For curved stone walkways, use garden hoses instead of string and stakes. Winding a hose in graceful curves as you go, simply meander from one end of the projected path to the other. This hose will mark one side of the curved stone walkway. Take another hose and repeat the process for the other side, matching the curves already established by the first hose. You will want the width to be fairly consistent from one end to the other. Stand back and judge the look. Does it curve in the most opportune places (such as around a specimen tree)? Walk between the two hoses for a test run. See how it feels. Is the winding excessive? Just go back and tweak the layout of the hoses, until the curves feel and look right. Then take a can of bright spray paint (white, yellow, etc.) and mark the line of the hoses with paint. Allow the paint to dry. Now it is time to use a spade, which is essentially a flat shovel meant for chopping straight down through sod into the soil. Plunge the spade down 5 inches deep all along the course you have plotted out for your stone walkway. Then switching to a digging shovel, excavate all that sod and soil, down to a depth of 5 inches. You will want to end up with a base as even and flat as possible. Moisten the soil in the excavated area with a garden hose and tamp it down with a tamping tool. Set landscape fabric down over the base you have just established for your stone walkway, to suppress potential weeds later. Now shovel 2 inches of sand over the landscape fabric. Tamp the sand down with the tamping tool. This will leave you with an excavation 3 inches deep -- just right for the thickness of the building material assumed for this project. Beginning at one end, place some of your rocks down firmly on the sand base. If you have rocks of many different widths and lengths, the task at hand will remind you of your puzzle-building exploits as a child. Keep the gaps between abutting rocks as small as possible. At this point, you are just getting a feel for handling the rocks. Continue laying the rocks out along the projected path. But this first alignment will be temporary, so do not spend too much time on it. Just lay out the majority of the rocks, using your largest pieces and focusing on the middle of the path. Now stroll down your stone walkway using your normal gait. You are testing to see if your feet fall in the middle of the rocks, so that you are comfortable. No doubt, you will need to adjust the pieces. After making the necessary adjustments in the positioning of your larger rocks, start plugging the gaps with your smaller pieces. The need for adjustments is the reason why I advised you not to "spend too much time" in Step 11: all of the smaller pieces would just have been in the way during the re-positioning of the larger ones. Again, keep the gaps between abutting rocks as small as possible. Using a carpenter’s level, keep checking for levelness (from left to right) between the rocks you are laying. That is, the width of the stone walkway should be kept roughly level. The other dimension (namely, front to back) can be made level only if you are working on a level piece of land to begin with. If a stone is resting too far down into the sand, remove it and place more sand under it. If a stone is sitting up too high, do the opposite: scrape away some sand from under it. When you are through laying rock, apply sand to the remaining gaps and tamp it in as best you can, perhaps using a small piece of wood for your tamping. Curved Walkways vs. Straight Ones: Which Is Better? You've probably seen people build brick or flagstone walkways across their yards that are curved, rather than going straight from point A to point B. Building curved walkways serves an aesthetic landscape design purpose. Building curved walkways softens the landscape by counteracting rigid lines (a rectangular house, a straight driveway, etc.). If the walkway cuts through an area with great visual interest (for instance, a variety of garden and flower beds, shrubs, trees, statuary, water garden, rock garden, etc. ), building a curved walkway makes more sense than a straight, no-nonsense walkway. You'll want to meander through such an area, slowing down to fully appreciate its treasures. But don't go crazy and build all your walkways or pathways curved, indiscriminately. It depends on the function of the walkway. If you're building a utilitarian walkway (such as providing a path for you to haul groceries in to the house from the car), you will normally want to build a straight walkway. Here is something to consider if your stone walkway will be cutting across a lawn. By keeping the surface of the stone walkway on the same level as that of the surrounding lawn, you will be able to mow right along the path. By contrast, when the rocks are allowed to stick up higher than the lawn's surface, you will need to go back after mowing and trim along the path. Who needs the extra work? Not I. Laying stone walkways in sand, as opposed to mortar or concrete, is known as "dry construction." Dry construction is easier for do-it-yourselfers than wet construction. Not having to worry about finishing the placement of your rocks before a layer of mortar hardens makes for a much more happy-go-lucky project. You can make adjustments as you go, on your own time-table. However, wet construction is more "permanent." Rocks laid in sand will have to be re-adjusted over the years. If you do not mind tinkering with a project after it is "done," this should not present a problem. Just make sure you stay on top of it, so you do not end up with a lawsuit on your hands after someone trips over a loose piece! For wet yards, some additional drainage may be required under stone walkways. To achieve this, simply excavate deeper at the beginning of the project. Then apply a layer of crushed stone before shoveling in any sand.